1307 : According to the 15th century Swiss chronicle legend, William Tell was made to shoot an apple off his son’s head. The legend goes as follows: an Austrian Vogt (like and over lord or bailiff) by the name Albrecht Gessler first installed a pole in the village square on which he hung his hat. He ordered that all passersby must uncover their heads and bow before it. On November 18th of that year, a local farmer and expert marksman William Tell and his son were passing through the village, when they came across the hat in the village square. They refused to take off their hats or bow, for which they were arrested. Gessler had heard of Tell being a good shot with his crossbow and so he devised a cunning punishment for the two. He ordered that an apple be placed on the son’s head and told Tell to shoot the apple with a single arrow from a distance of 120 paces. If he could accomplish this, they could redeem their lives and ensure their freedom. However, if he missed they would both be executed. Tell paced off the distance, removed two crossbow bolts from his quiver, and using one he shot the apple right through the center with one swift motion. Before releasing them, Gesseler asked Tell why he had taken out two crossbow bolts before taking the shot, to which Tell replied that, had he missed the shot and accidentally killed his son, he intended to kill Gessler with it, a shot he knew he wouldn’t miss. This no doubt angered Gessler and he order that Tell be arrested and taken by ship to his castle at Küssnacht. However, while they were transporting Tell by ship, a storm broke out and the crew needed all the strength they could get to steer through it. They unbound Tell to have him help them, which gave him the opportune moment to escape, leaping from the boat. He then went to Gessler’s castle in Küssnacht himself, waited for Gessler to arrive and then killed him. 1626 : The Papal Basilica of Saint Peter, better known as St. Peter’s Basilica (now in the Vatican) was consecrated. Built over the shrine, believed to be the burial place of St. Peter, a disciple of Jesus, the old Church was first built by Emperor Constantine between 319 and 333 AD. The church stood in exactly the same spot as the newer church by the same name stands today. The Old Saint Peter’s Basilica church gained in importance as Papal coronations were held there; Emperor Charlemagne of Rome was crowned there; and over the years it also became the burial site of many of the popes and saints. Unfortunately, in the 15th century the church was almost in ruins and although they had thought of renovating and preserving the old structure, in 1505 Pope Julius II made the decision to tear it down and build a new Basilica over the same spot, preserving just the original alter for the new structure. Construction began on 18 April, 1506, and over the next 120 years, a number of Popes, architects and builders forged on with Julius’ plan to rebuild the St. Peter’s Basilica into the building it is today. On November 18, 1626 the newly finished St. Peter’s Basilica was consecrated by Pope Urban VIII. 1925 : George Bernard Shaw became the first Nobel Laureate to refuse the Nobel prize. Shaw was selected to receive a Nobel Prize for Literature “for his work which is marked by both idealism and humanity, its stimulating satire often being infused with a singular poetic beauty”. However, Shaw who had a general dislike of prizes and had previously called the Nobel a lottery, refused the award at first and was even rumored to have said “I can forgive Alfred Nobel for having invented dynamite, but only a fiend in human form could have invented the Nobel Prize.” However, he later changed his mind at his wife’s behest as it honored Ireland and accepted the award a year later in 1926. In Shaw’s typical straight-forward manner, he accepted the honor, but could not make himself accept the £7,000 cash prize and instead created the Anglo-Swedish Literary Foundation, to aid the translation into English of classical Swedish literature. He is the first person to have ever won a Nobel Prize in Literature and an Oscar. To add to his rejected honors, Shaw had even turned down the offer to be knighted and an informal offer of the Order of Merit. 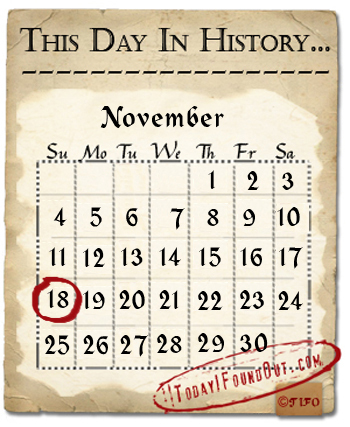 1928 : The 18th of November is considered by Disney as the birthday of their fictional cartoon character Mickey Mouse. On this day in 1928, Mickey mouse made his third appearance (the first two were undistributed test silent cartoons titled ‘Plane Crazy’ and ‘The Gallopin’ Gaucho’). His “first” official appearance with fully synchronized sound was in the animated short ‘Steamboat Willie’. This was also Mickey’s official debut and the first of his films to be distributed. On this same day in 1978, Mickey became the first fictional cartoon character to be presented a star on the Hollywood Walk of Fame. This was in honor of his 50th anniversary. Mickey turns 84 today!